Sigourney Weaver calls out the lack of mothers in media and explains why she agreed to play a role in Alien: Isolation. Sigourney Weaver has played a variety of roles in her acting career, and she looks back on Ellen Ripley as one of her more iconic characters. In an interview with The Mary Sue, Weaver says she believes video games are expanding as she sees Alien: Isolation making use of emotion. Weaver reprises her role as Ellen Ripley in Alien: Isolation from the Alien movies, where she played Ripley in the four films starting in 1979. Ellen Ripley is playable only in the Nostromo edition of Alien: Isolation, which was available for free as a preorder bonus. 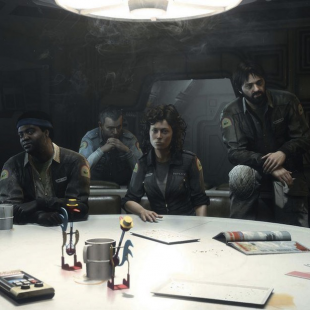 Weaver has been approached to get involved in other games, which are sometimes related to Aliens, and she decided to do Isolation because it used details from the movie's script while going in a new direction by featuring Ellen Ripley's daughter, Amanda Ripley. Ripley never reunited with her daughter in the movies. Weaver found Alien: Isolation interesting because it has an original story that's also faithful to the movies while going in "an emotional direction." "I think video games themselves are expanding to please a lot of different appetites - a lot of different kinds of gamers," Weaver said. "Maybe gamers who are more interested in story than, kind of, target practice. So I'm kind of delighted that this happened now, because I think that gaming is so sophisticated, that it can give you such an immersive experience, this is the perfect time for this game created from something that was made 35 years ago." Weaver noted to TIME that both her husband and daughter play games like Grand Theft Auto and Crazy Taxi, and she compared the feeling of immersion in games to how she feels acting as a character. Weaver, who said she easily slipped back into the role of Ripley, is both stunned and isolated by her iconic role. Heroines are rarely mothers in movies or video games. She's proud to play different kinds of female characters, and she calls women "the glue that holds the world together." "And it is women who are mothers, particularly - who are on the front lines of many things in life - they hold the family together, they change things in their communities, they run businesses." Weaver was excited to enter video games for her role and hopes that games will continue to grow and feature complex characters of different genders. "I simply have seen a lot of women in strong roles in the movies, and I think if more games are made with a bigger spectrum that characters will get more complex, and I think that certainly will mean there will be more women characters," she said. "Men and women. "There's so many great examples in the world of powerful, interesting personalities that I hope it's more - perhaps if more women choose to enter this field of creating games, that will happen." Alien: Isolation launched today, October 7, on PS4, PS3, Xbox One, Xbox 360, and PC.